If there’s one thing we’ve learned from his stay in Boston, it’s that it’s really hard to dislike Hanley Ramirez. Regardless of his escapades on the field, Ramirez has been incredibly endearing as a player. From his infectious attitude to his trademark swagger, there’s something to like with him, no matter who you are. From shadowboxing during a live interview to staring down the camera, Ramirez is a guy you really want to root for, because when he’s good, everything is great, and someone being as contagiously fun as him is something you don’t see all that often. The problem is those aforementioned escapades. We look back on his 2016 season fondly because of two major aspects: he was healthy and he was productive. The former is a requirement for the latter, yes, but that’s the same with every player. The problem is that the Red Sox would have him play despite nagging injuries. You probably remember him crumpling his shoulder during his disastrous outfield experiment in early May 2015, and while his first half that season was solid, with a .223 ISO and a .816 OPS, he cratered in the second half, crashing all the way down to a .449 OPS before being benched for the youngsters later on. 2017 was more of the same, although to a lesser extent. Ramirez started this season on a strict diet of starts as the designated hitter, and seldom saw the field due to a shoulder injury that limited him to 17 starts at first. While his first half in 2017 came with a solid .794 OPS, he once again faded in the second half, with his OPS dropping 100 points, his plate discipline eroding, and his batted-ball profile heading south. It’s hard to dismiss what Ramirez has done so far, which admittedly is a very small sample, but it’s encouraging for the oldest player on the 25-man roster. Is it fair to place the blame for playing poorly through injury squarely on Ramirez’s shoulders? Probably not, no, because 1) his desire to play wasn’t put in check by a Red Sox team that hasn’t had a good grasp on injury management for years, 2) injuries like 2015’s can be unexpected and freakish, and 3) quite frankly, I’m scared that putting that much weight on those shoulders could injure them again. Nevertheless, it became really easy to write him off coming into 2018, with the signings of Mitch Moreland and J.D. Martinez both poised to take plate appearances from the aging infielder. Ramirez said he was healthy, and had a healthy Spring Training, so maybe we were just underrating him, because he’s had one hell of a start to the season so far. Maybe he just likes playing in Florida. I don’t know. Either way, it’s hard to dismiss what Ramirez has done so far, which admittedly is a very small sample, but it’s encouraging for the oldest player on the 25-man roster (until Dustin Pedroia comes back). Of all the optimistic stuff we’ve seen, the most intriguing has been his batted-ball profile. Yesterday, Cam Ellis wrote about the Red Sox being more aggressive on pitches in the zone, and Ramirez has certainly picked up on that. His swing percentage on pitches in the zone jumped over 10 percentage points from 2017 to a hearty 80.6 percent, and with that came a nice spike in contact rate in the zone too, jumping up to 93 percent from 86 percent in 2017. He’s swinging more, and making more contact. That’s pretty good, as long as the quality of said contact is improved, and to some extent, it has. Line drives and fly balls are slightly higher than his 2017 marks, and the grounders are disappearing. There’s a lot of pop-ups mixed in those fly balls as well, but with the six-game sample size we’re using, that’s to be expected. But in the end, we’re still talking about that relatively tiny six-game stretch. There’s got to be something else other than hoping those numbers can play out over the next 156 games, right? Sure is! Let’s take a look at Hanley’s home run from Monday. That’s not exactly a towering blast, but there’s a lot of strength involved. Trevor Richards hangs a slider that doesn’t catch a ton of the plate, but hovers over the outside corner. Ramirez whips it all the way around to left field for a home run. I understand Richards isn’t a mystifying pitcher, but that’s some subtly impressive power, and he doesn’t (or can’t) do that with a hurt shoulder. Those cranky joints of his are going to be the most important things when gauging how well he can do. Hanley with two healthy shoulders can hit those hanging sliders. Hanley with less than that gets eaten up by them. Imagine what he could do with a third shoulder! It was difficult to watch that game on Monday and not think Ramirez was going to go on a tear. 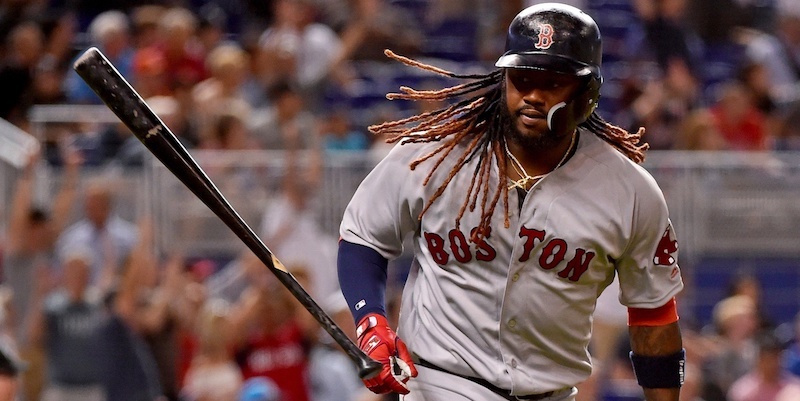 He hit that homer, had a single to go along with it, and was diving for baseballs on the infield dirt like he was ten years younger — which they don’t have highlight videos of, sadly, because when Hanley’s feeling good, you can tell. He emphatically fist pumps when the Red Sox turn a clutch double play. He goes all-out for hard-hit grounders and plays some empirically good defense. He shows why his goal of a 30/30 season isn’t just a pipe dream, even though everything from age to potential playing time is against him. This is fun. This is exciting. This is what a healthy Hanley Ramirez is, and I hope he sticks around, because he makes the Red Sox so much better. Yes, but, alas, he has to go.